You can program the route in the CDU. As far as I know the routemanager altitudes are also respected, as they show up on the CDU flight plan page. legoboyvdlp wrote in Sun Jan 13, 2019 4:57 pm: You can program the route in the CDU. As far as I know the routemanager altitudes are also respected, as they show up on the CDU flight plan page. That's great, but you can write down your altitudes on a piece of paper, then throw that paper out your cockpit window just before you taxi. I was an air traffic controller at Los Angeles ARTCC for 8 years, and 4 years as an instructor. You will get what I tell you. I got used to doing the climb and descent calculations in my head. I know what I need. But despite that (got that worked out), the landing lights are OUTSTANDING! Gotta use Rembrandt rendering to really appreciate them. Still needs work on the panel lighting for night operations. Fly low, fly slow, land on a dime. Twin Otter. Hmm - not sure, but I think it's lower left, just below the PFD? I think it's beside the fuel switches. Not exactly sure... And I'm not sure if they actually work yet. legoboyvdlp wrote in Sun Jan 13, 2019 5:12 pm: Hmm - not sure, but I think it's lower left, just below the PFD? I think it's beside the fuel switches. Not exactly sure... And I'm not sure if they actually work yet. That switch has no effect. The switch panels are still dark. Edit: I completed only about half of my flights today. The rest were terminated by a program abort. Flightgear just quit. My version of the CitationX uses about 40% CPU usage on my Intel i7 3.4GHz. This version uses about 75% in normal mode. If I increase the sim speed to 4x, it causes the CPU usage to go above 100%, and the flightgear program will abort. Just FYI. also, the wing would have been stalled, and yasim does not handle stalls gracefully. I took control just before you started the pitch up and did the same but with opposite aileron, it barrel rolled the other way. and looking at your fgtape, the pitch bug definitely is fixed on your citationx, not sure why you claim it wasn't? OK, thank You for analyze. IMHO, aileron input with value 0.02 is too smal for roll rate more than 180degs in 1 second in all what is heavier than RC toy plane When I tested roll rate in standard style - level flight, 200 KIAS, full barel roll was much much slower, than this one with full elevator input. And pitch bug - do You thinking, that initial pitch speed when I moving yoke from center position to it's extent is 2 or 3 times greater than speed, when I do not moving yoke is OK ? This is common problem on almost all YASIM aircrafts. I know only 1, where this bug doesn't exists - try C-130. 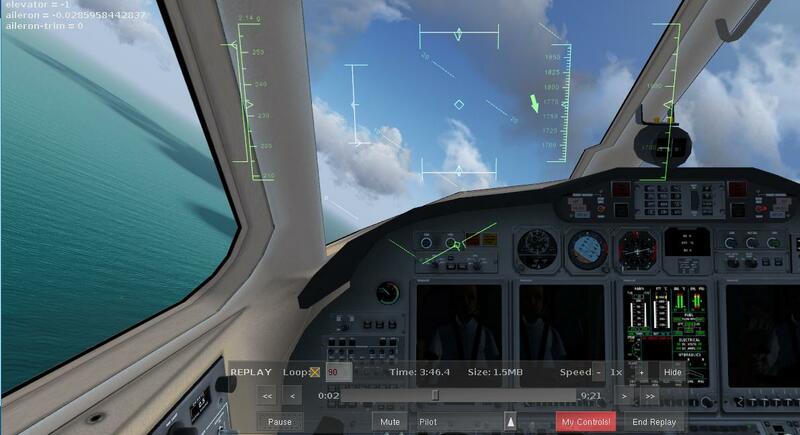 About pitch bug - check moments of the take off, You clearly will see move steering column to back, plane starts rotating and without any next movement of the yoke pitch change speed drop to very low value. Speed of the pitch change is large only in the time of the yoke movement. I've given up on it. I'm back to mine. This crashes flightgear about 75% of the time when I use it with the route manager. It is frustrating to get to the initial approach fix to have the whole thing disappear and leave you at the desktop.